Quinns: In (almost!) five years of running Shut Up & Sit Down we’ve always put the game first. We’ve fretted about player counts and waxed lyrical about themes. We’ve snapped apart mechanics like so many Lego bricks. So today, I hope you guys will indulge me in putting something else first. Look. At. This. Flipping. Box. I mean that literally. 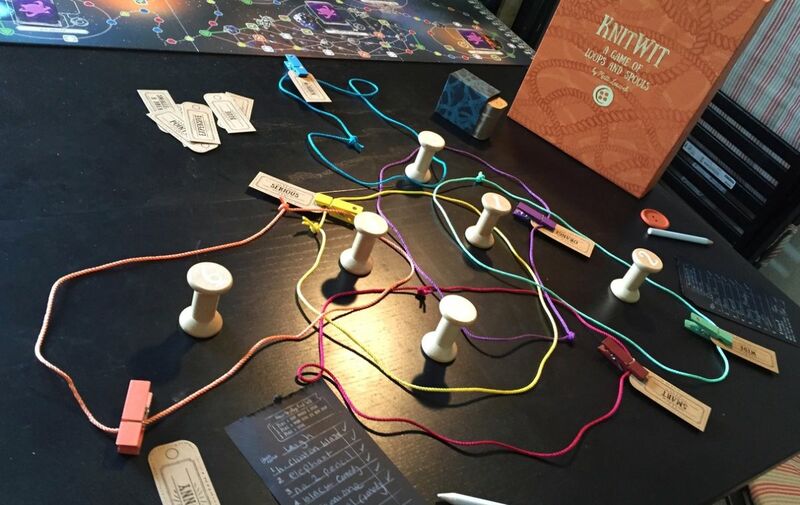 Knit Wit, the new game from Pandemic creator Matt Leacock, is opened with a flip-top magnetic catch at one end. But we’re just getting started. The box’s logo and back-of-the-box information is contained on a slipcase that you can throw away (or keep!). I’ve been complaining about noisy boxes for so long that I actually gasped when I saw this. “Someone was listening,” I whispered to myself, squatting in the corner of my living room. Without the slipcase Knit Wit becomes nothing more or less than a lovely, subtle box. Not only that, if you’d rather have the logo? 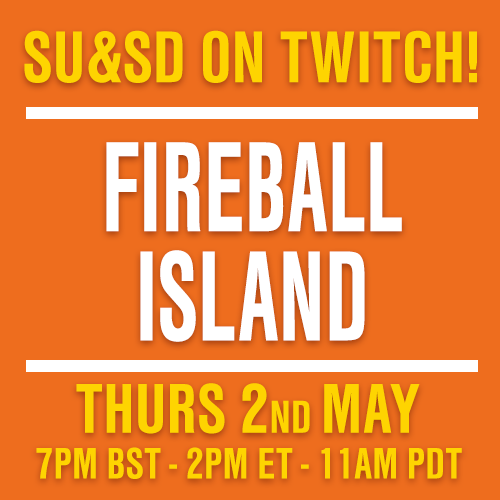 Guess what! You can have logo. I never imagined we could all co-exist, but here’s F2Z, bringing peace to the world. I want every single big-box game publisher to start sleeving games like this. Then you actually open the box, and… well. I’ll let this speak for itself. Note the little compartment on the box lid. In there you’ll find Knit Wit’s manual, but once you know how to play the game you’ll never see it again unless you want to. Between this, Flick ‘em Up and their deluxe card games, I’m calling it. Days of Wonder no longer make the nicest boxes in the business. That honour now belongs to F2Z Entertainment, owners of Z-Man, Pretzel Games and Plaid Hat. Asmodee? You’d better step up your game! 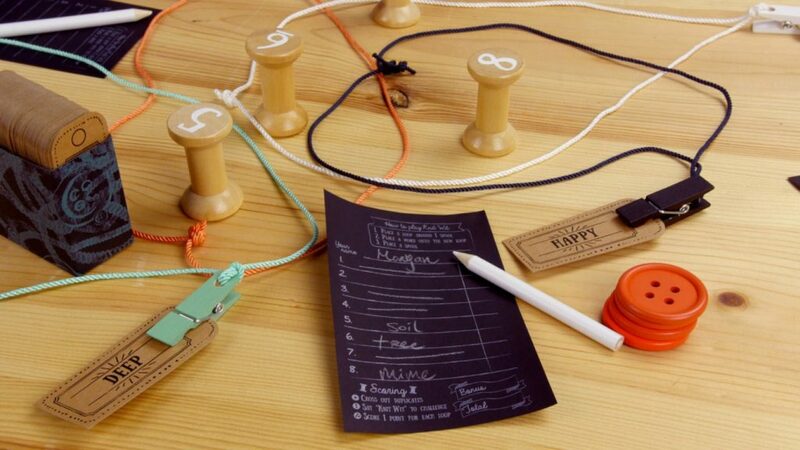 Immediately setting itself apart from the tricky tracks of String Railway, Knit Wit is a very simple word game. 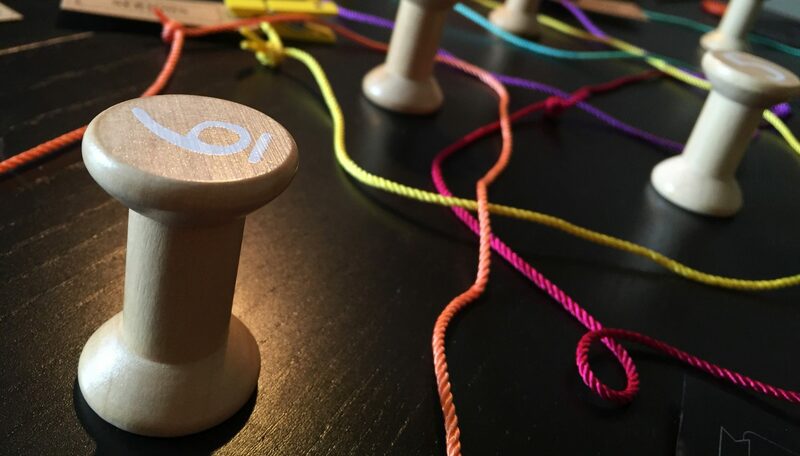 Each game starts with 2 to 8 players taking turns to add a single loop to the table, clipping a randomly-drawn word to their loop, and then placing a wooden spool in any unoccupied area. And the game can begin! 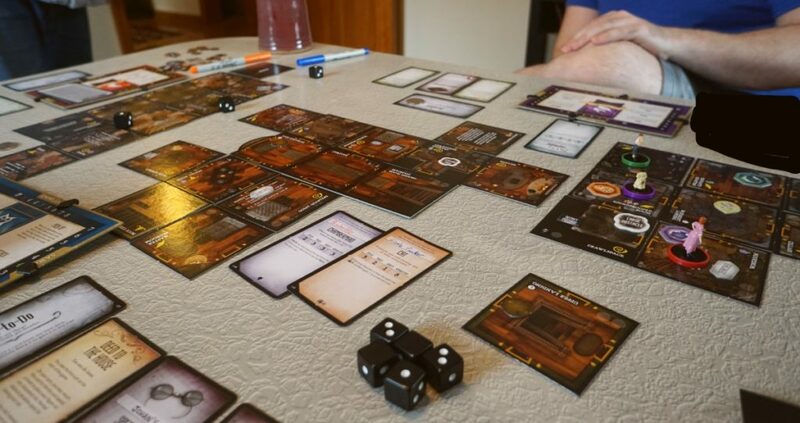 Each player takes their fashionable black answer sheet and must scribble down words OR a series of words that fit all the descriptors that each spool is looped into. So if the #2 spool is sitting in “Living”, “Slow” and “Blue”, you could write down “Whale” or just “Sedated member of the Blue Man Group”. 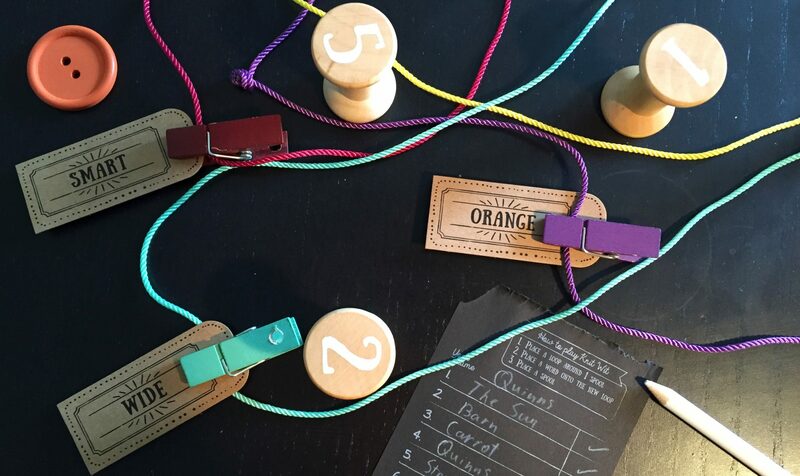 Just like in SU&SD favourite Pictomania, players all race to answer as many questions as possible before grabbing the top-most button off a stack that ends their guessing, but offers some extra points. When all of the buttons are gone, everyone has to stop guessing and it’s time to read out your (terrible, terrible) answers and total your points. In the panicked rush, it’s inevitable that you’ll all have written the sort of nonsense that even a stoned schoolkid wouldn’t dream of putting on their exam paper. 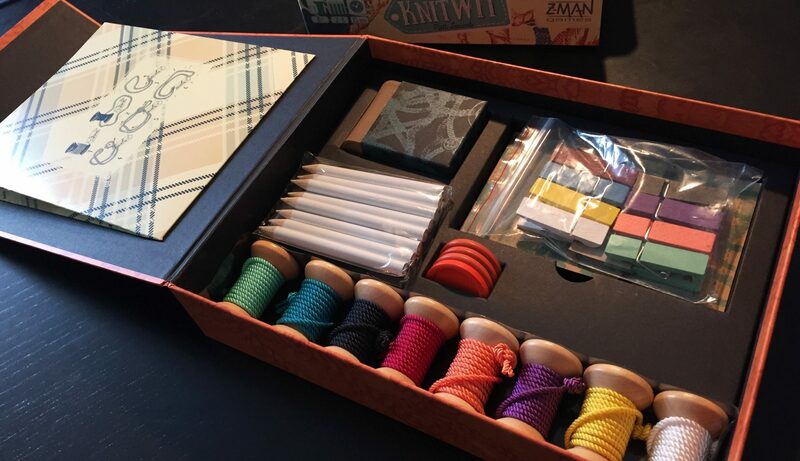 If you disagree with anyone’s answer you can shout “Knit Wit!”, putting this box in the awful/amazing district of board games that encourage players to shout their name, and that player has 10 seconds to defend their answer. After that, everyone gives it a thumbs up or a thumbs down, as if your answers were weird, flat little gladiators, fighting for their life in the arena of common sense. Let’s quickly get my criticism out of the way, because I had a load of fun with this game. While creating venn diagrams is fun – laying out your loop aggressively to force your word onto EVERY spool, for example – it turns out that parsing the same venn diagrams can be hard work. First checking which strings contain a spool, then tracking down the labels attached to those strings, then repeating all of those words in your head to get your finished question is certainly stressful, as if you were disarming a very provincial bomb, but you spend a bit too much time doing it considering it’s not where the fun of the game lies. No. Exactly like in Pictomania, the fun comes from inserting players into a pressure cooker that encourages them to put the minimum possible effort into each task, and seeing the nonsense answers they provide. Are you going to let your friend get away with “murder knife” for something bad and pointy? Is “Hilary Clinton blazer” acceptable for something wide, serious and orange? At one point I found myself having to give a 10 second speech as to why “Quinns” was a perfectly good answer for something serious, but funny. 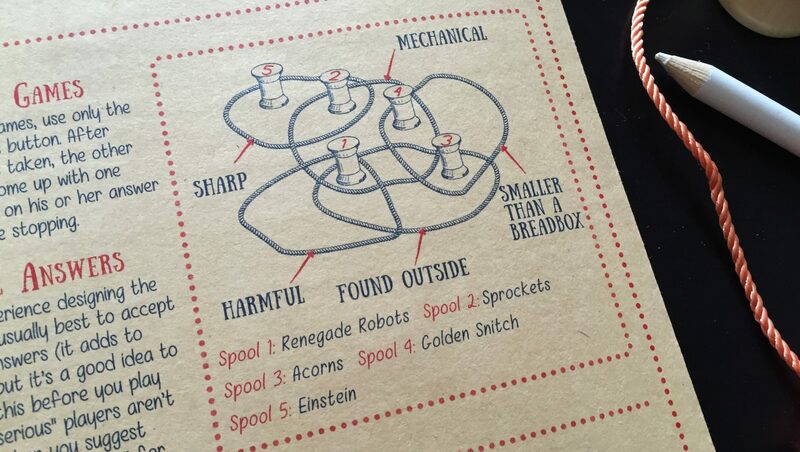 Fittingly for a game of teeny nooses, it’s Knit Wit’s loop that makes me so happy to recommend it. Unlike the constant pressure found in last month’s review of Greedy Greedy Goblins, Knit Wit starts with a pleasing setup as the game reveals itself, allowing players to chat for a bit, which is followed by the anxious real-time challenge, and then finally a funny third act as you all laugh at and strike out one another’s answers. It’s like a three course meal where every plate arrives at just the right time. You relax, you get excited, and then you laugh. Would you like to play again, starting with the relaxed bit? Then the stressful bit again? Then the funny payoff? Of course you would. You won’t get too excited, mind you. I’d never use a word like threadbare to describe Knit Wit (no matter how darn perfect it’d be in this review), but it’s true that Knit Wit is fairly sedate. It’s never going to be one of the games on my shelf that I’m truly excited to play, where someone suggests it and I go “OooooOOOooooh! Ooh. Oooh,” like a dying hair dryer. But maybe that’s ok. No, this isn’t a dramatic game. But that’s not to say you won’t play it very often. Fittingly for a game with such a tasteful box, it’s easy for a game of Knit Wit to fit in anywhere, far moreso than lots of games that do excite me. Let’s not forget that Knit Wit sits up to eight players. It’ll welcome in non-gamers. 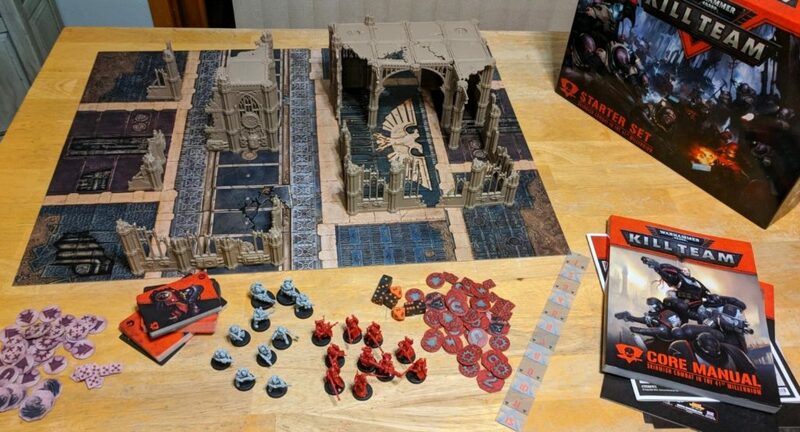 It can kick off a serious game night, where the setup allows players to make the game as tough as they want. It can even come out at silly times of night, when the fact that the “word” cards are blank on the other side will mean you can write your own words to make Knit Wit more rude or just plain mad. What is eternal and miserable? What is a frog but god-like? 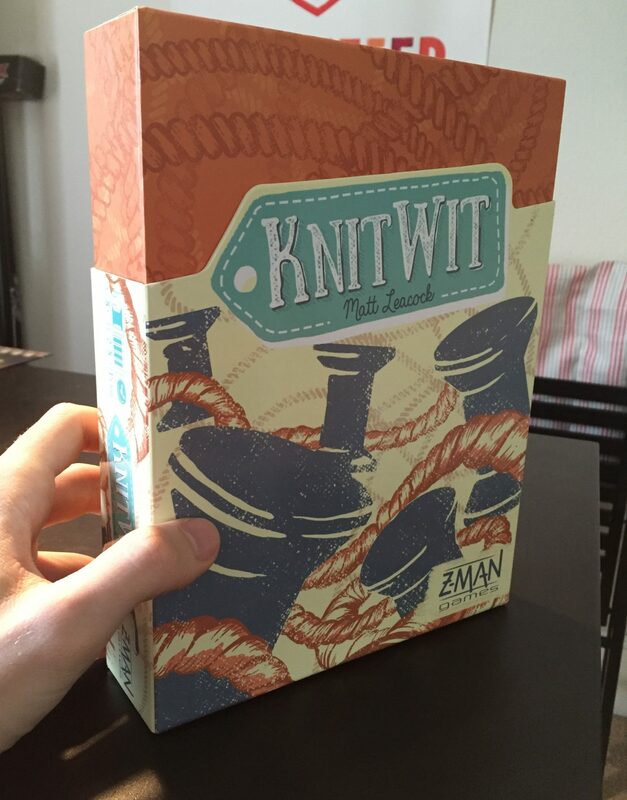 But maybe the single biggest reason I like Knit Wit is the same reason we’ve recommended so many games in the past. 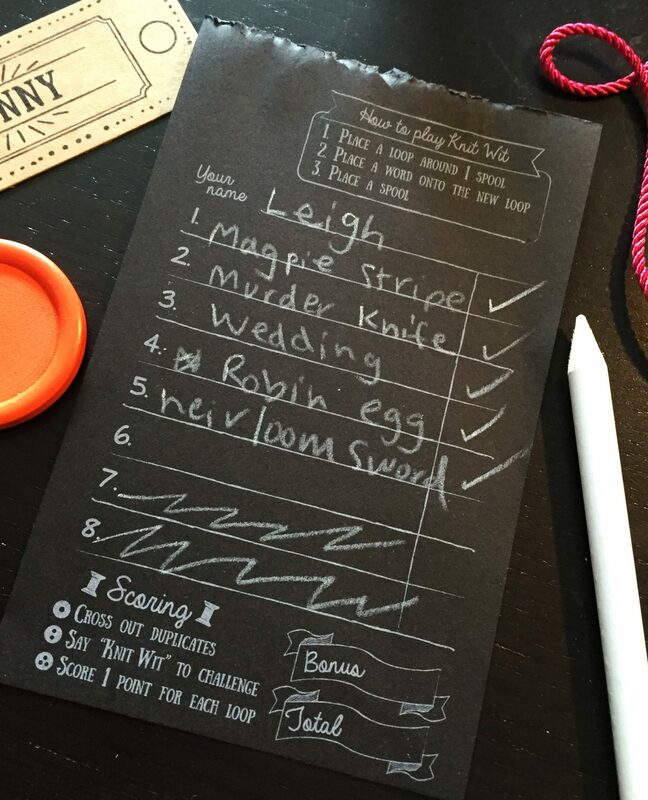 Because your friends and family have to come up with bizarre answers off the top of their head that they then have to defend, this is a game that lets your loved ones surprise and entertain you. It’s a game that makes them funnier.